A crypto debit card is any debit card that allows you to pay using at least one type of cryptocurrency. Crypto debit cards typically provide you with the option to pay using fiat currency as well. While you may prefer paying with newer payment technologies (i.e. QR code scans that automatically debit from a mobile banking app or crypto wallet), many people like having the option to use a card instead. Most, if not all, crypto cards offer the flexibility to pay using either plastic cards or mobile applications. Physical crypto debit card: Similar to any traditional debit card you can store in your wallet. The main difference is that you can also use it to pay with crypto. Virtual: Serves about the same purpose as a cryptocurrency wallet mobile app, except it’s usually supported by a payment company and may come with the option of a physical card. Pre-paid cards: Allows you to load cryptocurrency onto the card and automatically converts your crypto into fiat and vice versa. Non-pre-paid debit cards: These are typically connected to your online crypto wallet and convert your crypto into fiat whenever you make a purchase. The MCO card offers quite a few unique incentives. For example, it allows users of various purchasing levels to enjoy rewards programs. The rewards depend on the amount of MCO tokens you lockup, which can vary between 0 and 50,000 MCO. Even for users that don’t lock funds, this card offers one percent cash back. On Airbnb and Expedia, you can even get up to 10 percent purchase rebates on each booking, as well as unlimited airport lounge access and more. This card also offers benefits for streaming services like Netflix and Spotify. For some users, the lockup amounts might be too much to seriously consider MCO. For others, though, the enticing incentives could be enough to give crypto debit cards a try. In November 2018, the company announced a partnership with New York-based Metropolitan Commercial Bank to issue the card to US customers. MCO offers an incentive program that’s second to none thanks to its major partnerships. Founded in 2013, Cryptopay is one of the most established crypto card companies in the market. The Cryptopay prepaid card works online and offline. You can use this card at any store that accepts VISA debit cards. The company regularly updates user stats, which show exactly how popular this card is. As of March 21, 2019, Cryptopay boasts 1,011,514 active users, an increase of almost 100,000 since we looked at the stats back in August 2018. Additionally, Cryptopay completes 24,364 transactions per month. The company has issued more than 121,00 prepaid cards to date. While these numbers are impressive when it comes to crypto cards, it’s also important to consider that average transactions per month are still quite low. The good news is that Cryptopay is only now beginning to expand its operational territory. Originally, this company limited its services mostly to the UK. Now, Cryptopay is actively expanding its services throughout Europe, Russia, Singapore and other locations globally. Once focused solely on the UK, Cryptopay is now focusing on new markets like Europe, Russia, and Singapore. Wirex’s debit card provides fiat options (USD, EUR, GBP) and cryptocurrencies (BTC, ETH, XRP, and LTC). Additionally, you can complete fiat-crypto conversions at live rates. Card delivery is free, but you will need to pay a $1.50 management each month. Currently, Wirex is only available to citizens of countries within Europe. Wirex debit card fees include $2.50 for ATM withdrawals within Europe and $3.50 for ATM withdrawals outside of Europe. Online and offline payments for goods and services have zero fees. Bitcoin (BTC) users are eligible to join the Cryptoback program. This unique incentive returns 0.5 percent of your purchase in BTC every time you punch in your pin, swipe, or use contactless pay with the Wirex VISA debit card. Like other cards on this list, the Wirex cryptocurrency card can be used in any place where VISA is accepted. Wirex offers the option to earn 0.5 percent in BTC every time you make an in-store purchase, swipe your Wirex payment card, or use Tap and Go. Uquid is one of the best options on the market in terms of shipping delivery time. The company only takes 2-3 days to ship to customers located anywhere in the globe. Moreover, Uquid comes with unlimited ATM withdrawal limits and unlimited lifetime purchases. As of March 2019, it’s only available to citizens of European nations. However, Uquid plans to expand to regions in North America and Asia in the near future. 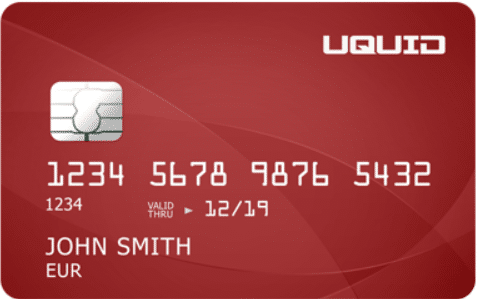 The starting price to purchase a Uquid cryptocurrency debit card is $16.99. This is quite high compared to most other cards on this list, with the possible exception of the high-end MCO cards with lockup requirements. Monthly management fees are set at a flat rate of $1.00. ATM withdrawals are set at $2.50 USD (countries within Europe) and $3.50 USD (all other countries). Uquid offers fast shipping and no limits on purchases. Most crypto debit cards on this list are only available to citizens of European nations. Still, there are also a few options for other locations. For instance, BitPay’s cryptocurrency debit card is accessible to citizens of all 50 states in the US. The Bitpay card costs $9.95 and includes a $5.00 monthly management fee. Fees for ATM withdrawals (within the US) are $2.00. Withdrawals from outside the US are $3.00 USD. Additionally, the company charges a rather steep 3 percent conversion fee for foreign currency ATM transactions. BitPay is one of the few crypto debit card options for US citizens. Crypto debit cards have a long way to go before they can gain mainstream adoption. Although these choices above generally offer decent services, many are limited in the number of people that can use them. This is largely due to legislation that makes approval processes difficult and/or lengthy. Unfortunately, some crypto debit card projects that seemed promising have fizzled out. One such example is Shift Card, which was the first US crypto debit card. It even allowed users to connect to Coinbase and spend funds at over 38 million merchants worldwide. Recently, it announced that it is retiring its program on April 11, 2019. Nonetheless, new projects are also emerging in this space. For instance, 2gether, a Spain-based FinTech startup, has announced that it will launch a prepaid crypto debit card that supports ETH, XRP, BCH, EOS, XLM and LTC. For now, it’s unclear where the crypto debit card is going. Even though the momentum this product once had is seemingly fading, there are also clear signs that companies are working to increase its functionality, appeal to new customer bases, and expand services to new markets.